There is no way one can observe the social transformations within a community and society without resorting to strong political clues in order to understand the sources of those transformations. And clearly, when things go wrong, we blame the politics, the legislators, the government. But when the political sphere moves away from the reality of the working and the middle classes, the laws and the policies have no real impact on the wide majority. The decision-making groups have little will to support change and the economic downturn Britain has been experiencing for over a decade seems to move towards a silent collapse. And nobody appears to take responsibility. The blame placed on the government rules like a shadow, hiding underneath the roots of bad financial decisions, personal greed and managerial incompetence. Let’s consider the situation the art sector is at the moment. 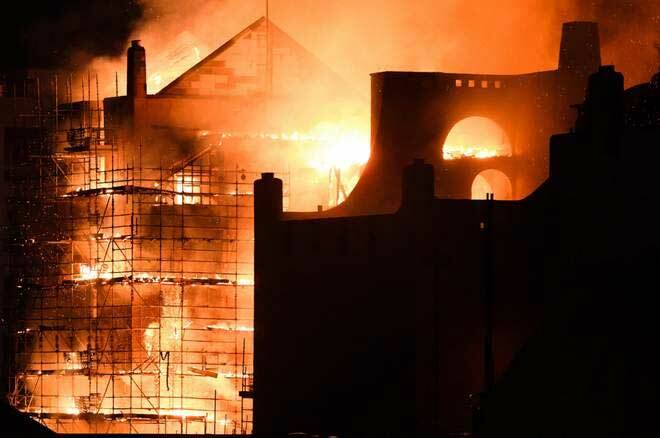 The issue came into focus with the news of the devastating fire which, this second time, damaged the Glasgow School of Art beyond repair. There you have £35m down the drain, or rather turned to ashes, and everybody is powerlessly looking at the building asking, with disbelief, ‘how could this be possible’. The fate of the Glasgow School of Art seems, for now at least, sealed by confusion and uncertainty. Who is to blame this time? Extrapolating the Glasgow tragedy, who is to blame for the uncertain fate of hundreds of art schools across the country slowly but surely decapitated by unachievable targets and percentages? We are looking at another type of devastating fire slowly cooking to ashes the art sector, in general, and the art education, in particular. The drive to achieve the funding targets, the attendance and the achievement rates, the literacy and the numeracy benchmarks. What do they all mean? Certainly, they mean nothing to those involved in the art sector (students, artists, writers, musicians, teachers) but mean everything to those in charge to justify the bureaucracy which supports their livelihoods and to satisfy the pleiades of regulators and inspectors. The focus of this type of education is not the youth’s creativity but to produce a nation of self-absorbed adults ready to slot into whatever social square has been allocated to them as soon as they joined the education system. And here we face again another type of politics. The ‘politics of inevitability’ as Snyder eloquently describes it, which makes the art education vulnerable and a victim of the constantly expanding globalisation. Since the mid ‘80s, the way we talk about art has fundamentally changed as well as the way the education system works to serve the economy, under the bright colours of neoliberalism. And, one would say, what is the problem with that? The education and the arts remain the essential social institutions within a healthy society and preserve what we call our ‘decency’. They remain our ‘sane barometer’ if you like, which support the configuration of our future and the values this future will act upon. I remember a recent conversation I had with a head of school who recognised that things have taken a turn for the worse, with the Brexit uncertainty looming, but, as he said, ‘what can one do against a whole government, with a mortgage to pay?’ And here we are again in the blaming game equation. The well-suited head back in his leather chair, the young artist back revising for another maths test. New financial cuts are drowning the hope of an economic recovery and the silence of those suffering its effects sounds more and more like a resigned agreement. Not once we feel that the history allows us to see patterns and to understand that action is a possibility. History permits us, ‘to be responsible; not for everything, but for something’ as the poet Czeslaw Milosz said. This responsibility has always worked against loneliness and indifference. This entry was posted on 20 June, 2018 in homepage and tagged Maria Stadnicka, The Politics of Inevitability and the Art Education. Bookmark the permalink.